On Thursday I go back to work after a couple of weeks leave but as usual I don't feel either as though I've achieved very much, nor that I've had a rest! I've sorted out drawers and the rest of my craft stuff, I've done quite a few chores, I've crossed lots of items off a to-do list but there still seems a lot left on the list including several biggies that I never got to. 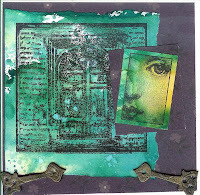 Anyway on Saturday I am taking another class at Kraft Crazy in Tidworth. This one is on distress inks so I have been busy making samples ready and tomorrow I've got to sort out all the papers etc. that I need. I've also prepared the sample for the binder that we're going to decorate in my August class so it's a relief to have that done ready. My sister in law came and stayed for a couple of days last week and we spent quite a bit of time playing especially with distress inks and with a pack of grungeboard that she kindly brought me. Some of the pieces got turned into a few cards and ATCs so I have something to show after all. This card is for my brother's birthday at the end of the month but he certainly won't be looking here! And I was especially pleased with this second card. 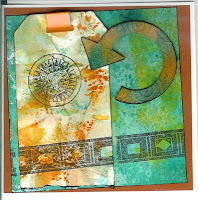 Great stuff Lynne--I know what you mean --I have been doing a lot of card/paper art stuff lately and I got my sewing machine out last night to make a Crazy Quilt block and I realised it had been 6 weeks since I used it.